Iranian Supreme Leader warns Iraqi PM not to trust the United States, claims it created ISIS. Iranian Supreme Leader Ayatollah Ali Khamenei on Thursday claimed that the United States created the Islamic State (ISIS) jihadist group, Breitbart reports. Khamenei's comments came during a meeting with Iraqi Prime Minister Haider al-Abadi in Tehran in which the Supreme Leader warned Abadi against “U.S. plots” and told him never to trust the United States. “Americans themselves created Daesh, but now that the terrorists have been defeated by the Iraqi government and nation, they pretend to favor and support such a major development,” said Khamenei, using the Arabic acronym for ISIS. Khamenei claimed the United States would “undoubtedly strike a blow to Iraq again” when it sees an opportunity. In discussing the fall of ISIS in Iraq, the Supreme Leader gave no credit to the U.S. coalition, according to Breitbart. Instead, he attributed the victory to “unity among various Iraqi ethnicities” and “the Baghdad government’s support for the popular forces,” by which he meant the Shiite-dominated militia groups in Iraq. The Iranian leader has long accused the United States and its regional ally Saudi Arabia of funding hardline Sunni jihadists, including ISIS. 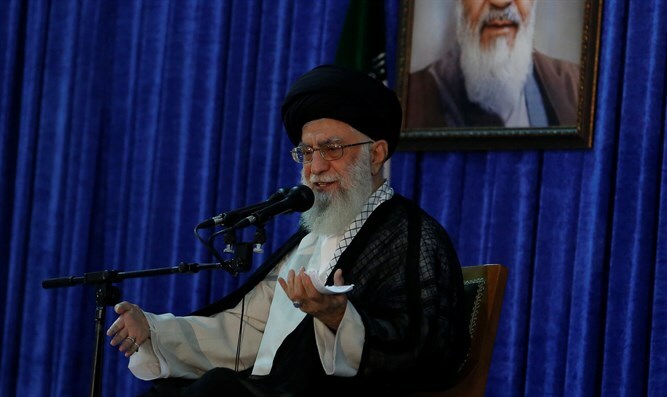 In May, Khamenei accused the U.S. of being responsible for the instability in the Middle East and also claimed at the time that it was responsible for the formation of ISIS. "You (the United States) and your agents are the source of instability in the Middle East...who created Islamic State? America ... America's claim of fighting against Islamic State is a lie," Khamenei said in a meeting with high-ranking Iranian officials. More recently, he threatened to “shred” the 2015 nuclear agreement his country signed with Western powers if President Donald Trump leaves it.